With HBO keeping all story and cast details about Game of Thrones Season 8 under wraps, fans have been clamoring for any details they can get their hands on, and now perhaps the biggest spoiler of the season has been uncovered. A new video has surfaced just outside the Belfast, Ireland set, with filming taking place at a location known as the Moneyglass estate. This video even has bigger implications than the Kings Landing battle scene that was teased in set photos from November. If you want to go into this season without any SPOILERS whatsoever, you should probably stop reading now, since, if true, this could have a major impact on the final season. When the King's Landing battle scene photos surfaced in November, it was reported that the Northern Ireland village of Moneyglass was being used to film Winterfell scenes, and for the first time in the show's history, the Winterfell walls will be built practically, instead of using CGI, and the production team was also laying down white tarps, to serve as the base for the digital snow. 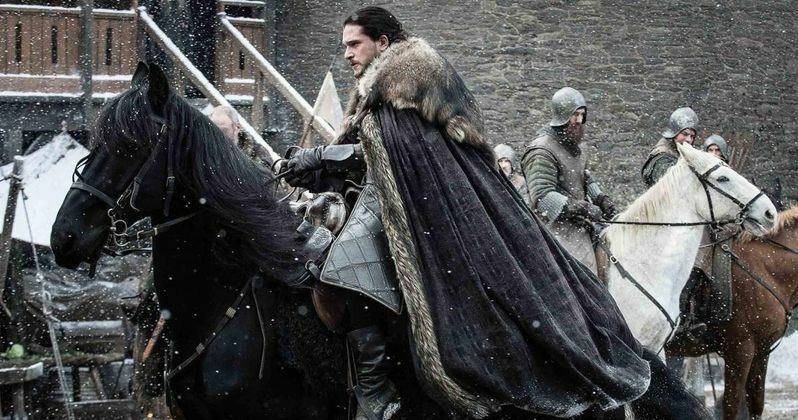 There was speculation that this was all being done due to a major battle scene in Winterfell, which has now been seemingly confirmed with this video. The video was taken by Facebook user Steven Mcauley, which confirms that the entire Winterfell set has been set ablaze, likely meaning the entire city has fallen. That raises the question of who set this city ablaze? This could very well be the work of the Night King and his zombie dragon Viserion. Even though the color of these practical flames are normal, the color could be changed to blue, much like how the wildfire was changed to green in post-production in Season 2 and Season 6. The Night King, Viserion and his army were last seen entering Westeros after taking down The Wall at Eastwatch, so it's certainly possible that Winterfell is one of their first stops as they try to destroy all of Westeros. Then again, the fall of Winterfell could just as easily be the work of Queen Cersei (Lena Headey). In the Season 7 finale, after Jon Snow (Kit Harington) and Daenerys Targaryen (Emilia Clarke) captured one of the white walkers, to show them the threat they pose to all of Westeros, Queen Cersei seemed to pledge her help to fight off this undead scourge. However, cryptic comments she made to her brother/lover Jaime Lannister (Nikolaj Coster-Waldau) indicated she really has no intention of helping the North, letting them fight the white walkers on their own, while sending Euron Greyjoy to bring the Golden Company back, a group of "sellswords," mercenaries who fight for the highest bidder. It's possible that she could send the Golden Company to attack Winterfell, but regardless, it seems Winterfell will be no more. What also isn't clear is who's all inside Winterfell while the city burns. Since this video was taken from quite a far distance, there is no indication as to who may, or may not, be in this stronghold of the North, as it burns to the ground. There is no way of knowing yet whether or not Jon Snow, Daenerys, Arya Stark (Maisie Williams), Sansa Stark (Sophie Turner) or Bran Stark/The Three-Eyed Raven (Isaac Hempstead Wright) managed to make it out of their homeland alive. After Watchers on the Wall discovered this Facebook video, Belfast Live confirmed that this fire on the set was part of a massive battle scene, which involved between 400 and 500 extras. Take a look at this brief video below as we wait for more on Game of Thrones Season 8.